Well, this lede pretty much wrote itself. A 13-inch tablet, seriously? Toshiba is pushing the form factor limits with the Excite 13, and while its dimensions make it stand out in a sea of 7- and 10-inch devices, that isn't necessarily what tablet buyers are looking for. There's no shortage of skepticism about such a large slate -- "slab" seems appropriate here -- so the Toshiba Excite 13 needs to provide an exceptional experience, with a brilliant display and smooth graphics, to make 2.2 pounds seem more palatable. On paper, its specs are promising: there's a quad-core Tegra 3 CPU under the hood, a 1600 x 900 display at 138 ppi and a clean build of Android 4.0. The company already has the Excite 7.7 and Excite 10 in its arsenal, and their good performance and bright displays make for compelling tablets. But how does a 13-inch tablet that starts at $650 round out that trio? Read on for our full impressions. As we took this tablet on a trip around the office to snap some photos, several strangers remarked that it's "way too big." And truly, it's only appropriate that we take a moment to note how huge the Excite 13 is. Dimension-wise, we're looking at 13.5 x 8.5 x 0.40 inches. Add in a weight of 2.2 pounds, and you can see how the Excite 13's extreme width and considerable heft could become burdensome. Toshiba thoughtfully includes a stand for propping up the slate at a viewing-friendly angle, which will come in handy if you plan on using the tablet for any extended period of time. 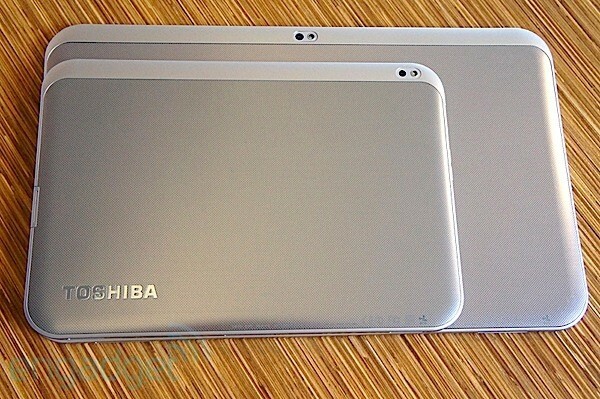 Like its smaller siblings, the Excite 13 has a much more polished design than Toshiba's earlier Thrive tablets. That chunky, chintzy build is replaced by a thinner silhouette and an aluminum casing that's elegant but still textured enough to provide a good grip. Though the tablet feels sturdy, it bends slightly when you apply significant pressure. That's not to stay this isn't a solid device; it feels tough enough to take a beating (read: one or two falls off the kitchen counter), and the display is coated in Corning Gorilla Glass for protection against scuffs and scratches. Taking a journey around the tablet starting from the top edge, we have the volume rocker and multi-function toggle (it locks screen orientation, locks hardware buttons or mutes sound, according to your specification under Settings), along with the 2-megapixel front-facing camera. A headphone jack, SD card slot, micro-USB port, micro-HDMI connector and the charging port lien the right side. The bottom edge is bare save for two large external speakers, and the left side hosts the power button. Around back is the 5-megapixel shooter with LED Flash. We can't move on without a word about the Excite 13's power cord: it could easily be mistaken for that of a laptop. Just another reminder that this device is truly huge. The 1600 x 900 panel is a great canvas for surfing the web, thanks to its ample size and bright, accurate colors. Now, onto that display. The 1600 x 900 LCD is a great canvas for surfing the web, thanks to its ample size and bright, accurate colors. We loved watching full-screen videos on YouTube and scrolling through Tumblr -- everything showed up in full, crisp detail. However, as with many other tablets, glare can be a huge issue, so you'll want to avoid sitting near heavy lighting while watching clips on the tablet. It's also worth noting that plenty of lower-cost tablets (ASUS' whole Transformer lineup, for example) come with easily viewable IPS screens in tow. Like the smaller Excite tablets, the Excite 13 ships with Ice Cream Sandwich (Android 4.0.3, to be precise). We appreciate that Toshiba doesn't deviate much from the standard ICS experience. Yes, there are some pre-loaded apps (more on those below) but the standard Back, Home and Recent Apps buttons in the system bar, along with five home screens to fill, are sure signs that this is a vanilla build of ICS. Toshiba's generous selection of pre-loaded apps includes Adobe Reader, Amazon Kindle, Amazon MP3, Crackle, Hardwood card games, LogMeIn, Netflix and Rdio. Of course, the standard suite of Google apps -- the Play store, YouTube, Search, Gmail and so on -- is here too. In addition to the stock Android keyboard, Toshiba includes Swype. There's also SRS audio enhancement on board, which, when toggled on, can boost volume and voice clarity. Think taking photos with a 10-inch tablet looks ridiculous? Try shooting with the Excite 13. Even if the two cameras were high-quality, the device's size is enough to dissuade most users from bringing it along on a family picnic -- and it's certainly not coming with you for a night on the town. You won't be tempted to stuff it into your bag either, because its 5-megapixel camera and 2-megapixel front-facing shooter are similar to what you'll find on the Excite 7.7 and 10 -- that is to say, quite bad. Photos show washed-out colors, and we found that both auto and manual focus were unreliable in helping us achieve crisp shots. Worse still, pictures are extremely pixelated, and most of our samples have a reddish cast to them. The Excite 13's rear-facing camera is also capable of capturing video in 720p. Much like our experience with still photos, sample clips appear blown out and a little fuzzy. On the upside, we didn't notice any motion blur or jerkiness when moving the camera to follow moving cars. On the benchmark front, the Toshiba Excite 13 delivers performance that's on par or slightly duller than other Tegra 3-powered slates. In AnTuTu, for example, it notched 10,873 compared with 12,027 for the new for the new ASUS Transformer Pad Infinity TF700. Predictably, too, the Excite 13 leaves tablets without quad-core NVIDIA insides in the dust: its Quadrant score of 4,016 bests Samsung's dual-core Galaxy Tab 2 10.1, which managed a score of 2,602. More anecdotally, the Excite 13 is powerful enough to support several apps running simultaneously, along with several tabs open in the browser. We browsed and scrolled through websites with nary a glitch, though occasionally the tablet took a moment to load content on image-heavy sites such as Tumblr. The Excite 13's large size allows for a 37.2Wh battery, which provides enough juice to get you through a full work day and then some. On our battery rundown test, the tablet lasted nine hours and 51 minutes. We've seen several smaller tablets hold out longer, including the Samsung Galaxy Tab 7.7 (12:01), the new iPad (9:52), the Transformer Pad Infinity (9:25), the Transformer Prime (10:17) and the Acer Iconia Tab A510 (10:23). The Toshiba Excite 7.7, with its smaller 15Wh battery, managed an even longer 10 hours and 34 minutes. Still, with everyday web surfing and light gaming, you'll get at least a day out of this puppy before needing to find an outlet. The Excite 13 doesn't have any direct competition. 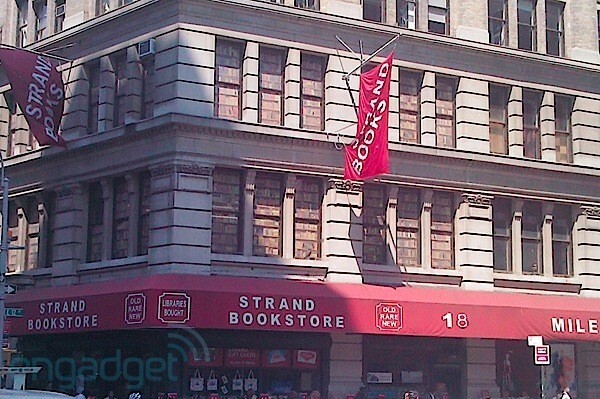 We mean, how many other 13-inch slates do you see on store shelves? Still, there's a handful of other Tegra 3 tablets to choose from, and this is hardly the only device offering a good viewing experience. So although the 13-incher is in some ways a category unto itself (for the time being, at least), we can break down your other options based on those two classifications. We've seen quite a few Tegra 3-powered slates that offer top-notch performance. The ASUS Transformer Pad TF300 ($379) is a strong option, with good graphics performance, an IPS display and an optional keyboard dock that allows for more laptop-like productivity. (The Transformer Pad Infinity, priced at $500 and up, is similar, except it has a higher-res 1920 x 1200 screen, a slimmer design and longer battery life.) Then there's the $450 Acer Iconia Tab A700, which also has a Tegra 3 chip and a 1920 x 1200 panel. The Excite 13 is a capable tablet, but we imagine many people won't be able to get past its size and give it a whirl. Processing power and a good viewing experience go hand in hand, but all the Tegra 3 power in the world won't make up for a dull display. The Excite 13's 1600 x 900 panel has a natural rival in the new iPad, which packs a whopping 2048 x 1536 pixels into its 9.7-inch Retina display. But if you're considering the Excite, you're probably looking to stick to the Android side of things, in which case we submit the Samsung Galaxy Tab 7.7 ($500) as a formidable alternative. Its Super AMOLED Plus (1280 x 800) display delivers beautiful, rich colors that make movie watching and web surfing a pleasure. Still, that tablet comes in a smaller 7.7-inch form factor, so you don't get the expansive screen real estate offered by Toshiba's device. 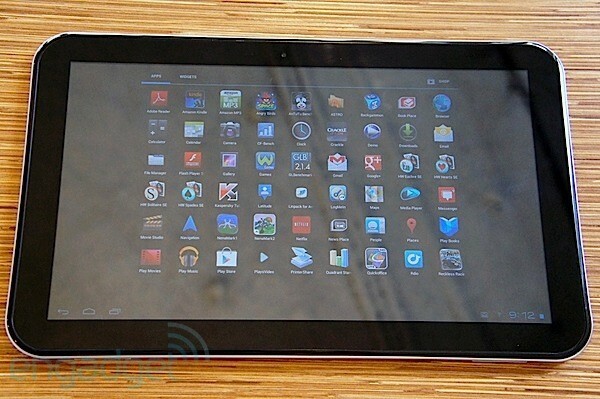 Put simply, the Toshiba Excite 13 is a huge tablet. It's a capable tablet, too, with a quad-core Tegra 3 processor that handles Ice Cream Sandwich well, but we imagine there are many people who won't get past its size and give it a whirl. In that regard, the Excite 13 reminds us of the Galaxy Note, a super-sized phone that never fails to produce a love-it or hate-it reaction. Sizeism aside, Toshiba's 13-incher is prohibitive in another way: cost. Shelling out $650 ($750, if you want the 64GB version) for a tablet that pretty much defies mobility is a bit ... impractical. We also couldn't bring ourselves to pay a premium for a device with such forgettable specs: a Tegra 3 CPU and a garden-variety LCD display. Why, you could easily find a similarly equipped tablet for $500 -- or less, even. Now it's true, Toshiba bundles a stand with this product, which is a big indicator of its unique place in the market: it could live on your desk, ready and able to cater to your gaming and Netflix-watching whims. If that setup suits your fancy, the Excite 13 has the capacious screen and solid performance to cut it. While you're at it, though, you might want to look into getting a wall mount.